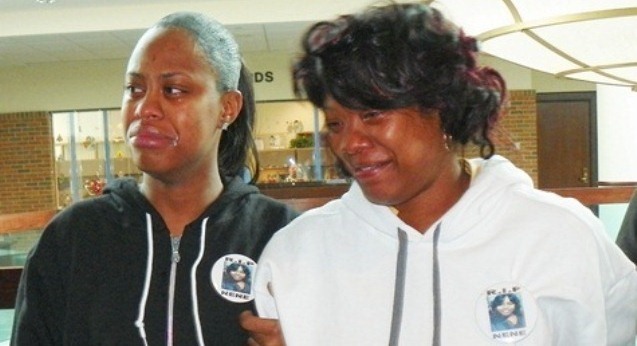 Renisha McBride’s mother Monica McBride (center) is consoled by the teen’s friend after the verdict Dec. 19, 2013. Her father Walter Ray Simmons is at left. DEARBORN HEIGHTS – Twentieth District Court Judge David Turfe bound Theodore Wafer, 54, the admitted killer of 19-year Renisha McBride, over for trial on all counts of second-degree murder, manslaughter and felony firearms Dec. 19. 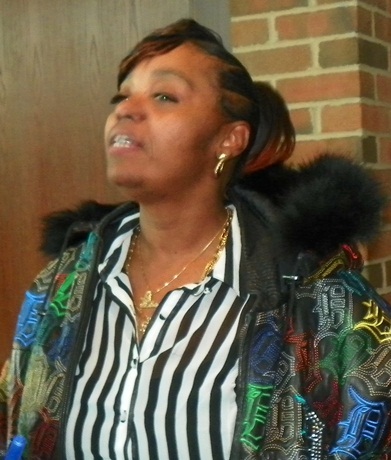 Wafer, a white Dearborn Heights resident, admitted to blasting McBride in the face with a shotgun, killing her instantly as she stood on his front porch early during the morning of Nov. 2, 2013, allegedly seeking help after a car accident. 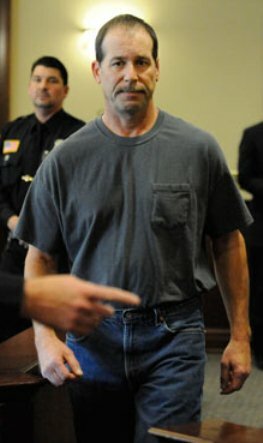 Theodore Paul Wafer at arraignment. “Uh, yes, I just shot somebody on my front porch with a shotgun banging on my door,” Wafer said during a 911 call played during his preliminary exam. “I live at 16812 W. Outer Drive. Thank you.” He hung up the phone after the dispatcher asked what city he was in. McBride, who was Black, was wearing a blue hoodie at the time. The case has gained national notoriety and been compared to the Trayvon Martin killing by George Zimmerman in Florida last February. “The testimony of the first witness, Carmen Beasley, summed it up in a nutshell,” Judge Turfe said during his ruling. 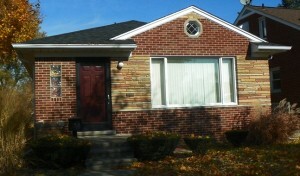 McBride earlier ran into cars parked in front of Beasley’s house on Bramell in Detroit. Beasley testified that she only went outside after calling 911, observing the scene, and noting a young woman who appeared to be hurt and dazed. She said she tried to help McBride, asking her to remain until EMS came. But, she said, McBride kept repeating, “I just want to go home,” then eventually wandered off down Warren Ave.
McBride’s family, including her mother Monica McBride, father Walter Ray Simmons, and other relatives and friends who sat through the one-and-a-half day preliminary exam, reacted with a combination of joy and sorrow, hugging each other and weeping outside the courtroom. 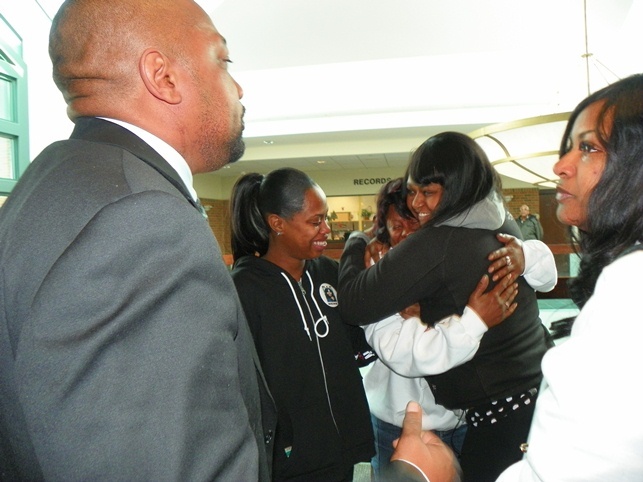 Renisha McBride’s mother Monica McBride (r) and sister after verdict. McBride’s aunt Bernita Spinks, acting as family spokesperson, thanked God. She repeated a slogan on blue hoodies worn by the family the first day of the exam. McBride’s girl friend, subpoenaed by the defense, testified that the teen became intoxicated at the home where she lived with her grandmother. She said the two friends were playing cards and a game of “shots,” in which a player drinks a shot of liquor each time (s)he loses a draw. She said she left after McBride became somewhat argumentative, but said she was never combative or hostile that night or during the years she had known her. Both she and a co-worker of McBride’s were subpoenaed to testify by the defense, which appeared to try to focus on McBride’s inebriation as the cause of her death. Cheryl Carpenter was heard telling the co-worker that he “better show up or face contempt of court” for the second day of the hearing. During the exam, Carpenter tried to introduce videotaped testimony by Wafer, given to Dearborn Heights police at their station the night of the killing, before they released him without charges. 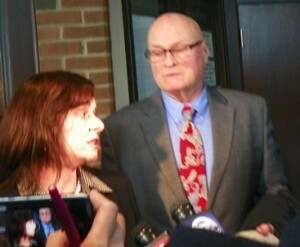 Judge Turfe ruled that the videotape was inadmissible under Michigan Court Rules because Wafer could take the stand himself and be cross-examined. Wafer attorneys Matt and Cheryl Carpenter. Testimony showed that Wafer had to go to a back bedroom to get the shotgun, open the solid front door behind a screen door, and then pull the trigger to kill McBride. A firearms expert testified that the gun used, a 12 gauge Mossberg model 500A shotgun, requires 6.5 pounds of pressure to pull the trigger, after first loading it with shotgun shells, racking it, and taking the safety off. The defense claimed variously that the shooting was in self-defense or accidental. At one point, attorney Cheryl Carpenter said it was possible that McBride held the screen door open and tried to grab the gun. Carpenter kept referring to “smudges” allegedly found on the side and front doors, claiming they showed McBride had banged on both doors with her fist or palm. Asst. 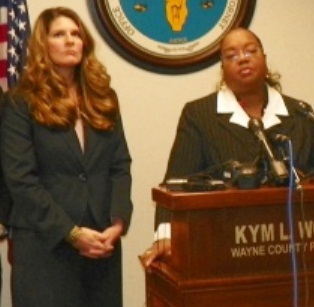 Prosecutor Danielle Hageman-Clark with Prosecutor Kym Worthy during announcement of charges against Wafer. Wayne County Assistant Prosecutor Danielle Hagaman-Clark responded that there was no evidence the smudges were even caused by a human being. Police also testified that there was no evidence of damage or attempted damage to door locks on either the front or side doors. Renisha McBride’s car at accident scene. The judge noted during his ruling that all witnesses who had contact with McBride earlier that night, including those at the scene of the accident, a co-worker and a friend, said that she was never belligerent or combative, despite the fact she had been drinking and smoking marijuana. Instead, she appeared dazed and confused after the accident, during which she may have hit her head on her car’s windshield. A photo of McBride’s car showed severe damage to the passenger side and the hood, both of which were badly crumpled. Another photo showed a large “spider” crack in the windshield. The car’s airbag was also deployed. Death house: Theodore Wafer’s home at 16812 W. Outer Drive, Dearborn Heights. Wafer, who has two drunk driving arrests on his record, was not himself tested for the use of such substances by Dearborn Heights police, who released him after he made a videotaped statement. Under orders from Wayne County Prosecutor Kym Worthy, Dearborn Heights police returned to Wafer’s home Nov. 11 to do a more thorough crime scene investigation, the officers said. There had obviously been ample opportunity for contamination of the scene.Their original investigation focused on whether McBride had been in the home or whether there was evidence she knew Wafer previously. 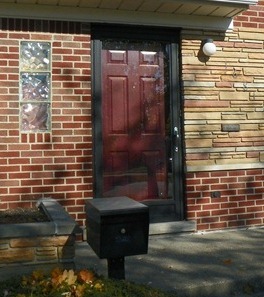 Close-up of storm door replacing screen door that Wafer shot through, which was not confiscated by police until nine days after McBride’s death. On Nov. 11, an officer testified, there was no evidence of liquor or illegal substances in the home. They did find and confiscate a crucial piece of evidence, the screen door through which Wafer allegedly shot McBride, in his basement. He had replaced it with a glass storm door in the interim. 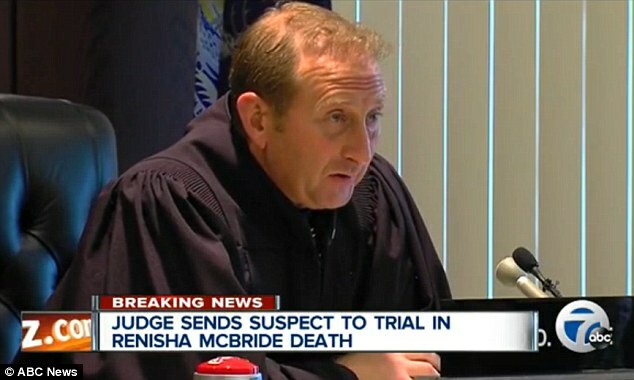 On the first day of the exam, Wayne County Assistant Medical Examiner McBride Medical Examiner Kilak Kesha was subjected to a lengthy, grueling cross exam on his credentials by the defense, including references to his education in his native India, but Judge Turfe qualified him as an expert witness. Kesha testified that McBride died from a shotgun wound to the face and that he classified the manner of death as homicide. A sketch of the wound showed it extending from her left eye downwards along her nose to her upper lip, approximately 3 inches long and 2 inches wide. He said there was no evidence of “close-range” firing such as stippling or soot, but estimated that she was likely three feet from the gun when she was shot, due to the limited pattern of shotgun pellet spread. He also said it was possible that the screen door may have prevented evidence of stippling. 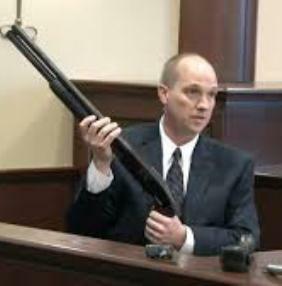 Firearms expert demonstrates 12 gauge shotgun Wafer used to kill McBride. He said that the pellets had “pulpified” her brain, including the frontal, parietal and occipital lobes, making it impossible to determine any possible previous brain injury from the car accident. He said if she had endured such an injury, it could have either caused aggressiveness or passivity, but there was no evidence to support either alternative. He said there was blood scattered on her body, including in particular on her right palm, but that after washing the body, it was evident that there were no injuries other than that to her face. He said there was no exit wound, and that he found from 10 to 20 “grossly deformed” lead slugs inside her head, along with plastic wadding and pieces from the shotgun round, although the autopsy report itself indicates only “multiple” lead pieces. 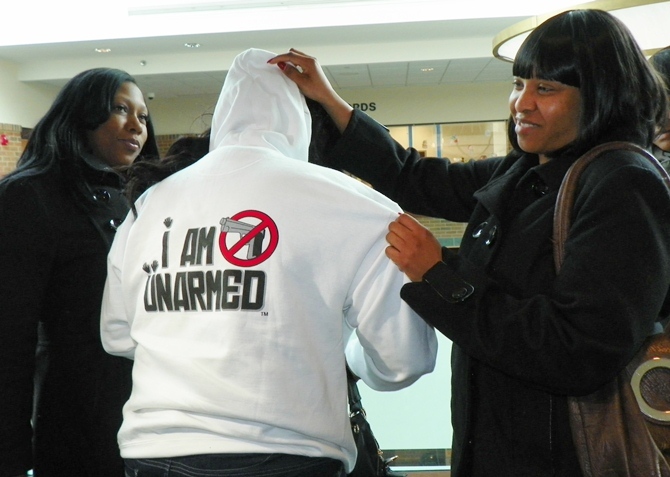 Renisha McBride’s friends show one of many hoodies with different slogans that they have had made to demand justice. Kesha testified that McBride’s blood alcohol count was 0.218, and that “if the time of death was at 4:30 a.m,” it could have been 0.28 to 0.29 at the time of the car accident around 1 a.m. He said there was evidence McBride had smoked marijuana, with an active count of 9.2 mg, but there was no way of knowing how recently. Over the defense’s objection, Pesha testified that there was no evidence that alcohol or marijuana had contributed to her death. Judge Turfe said in his summation that Kesha also testified McBride’s body was wet when it entered the morgue. There has been unsubstantiated speculation that she had therefore been in a body of water and was dumped on the porch. However, Dearborn Heights police disputed that in a statement, saying she was killed on the porch. An officer testified that a “light rain” was coming down when they arrived at the scene. 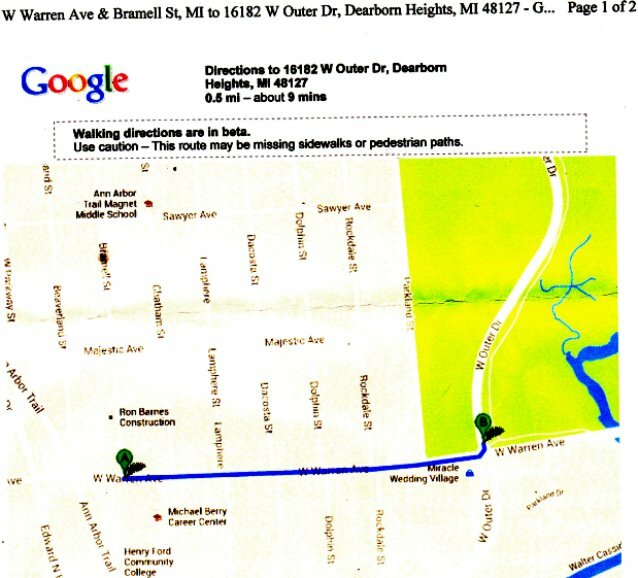 Map of short distance (half-mile) between accident scene and Wafer’s home. There has also been speculation about the alleged interval of approximately three hours between the car accident and McBride’s reported death. However, the time of death appears to have been based on the time that Wafer reported the killing to 911. A map shows that the distance from Bramell and Warren, the scene of the car accident, to Wafer’s home, was approximately one-half mile, which would have involved only a short walk. No evidence was introduced from neighbors or other witnesses who may have heard the shotgun blast itself, and at what time they heard it. The possibility remains that Wafer may have killed McBride earlier than the time he reported it, and that she lay on his front porch for some time in the light rain, which would explain the wet condition of her body. 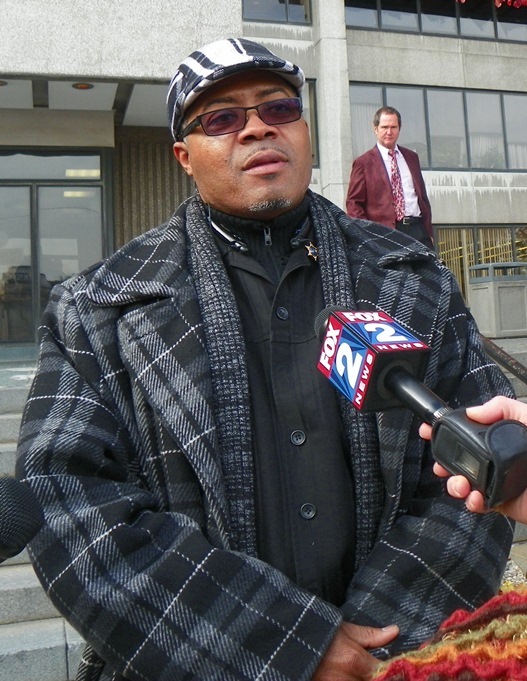 Wafer’s arraignment on the information will take place Wed. Jan. 15, 2014 in the Third Judicial Circuit Court (Frank Murphy hall) in downtown Detroit. Judge Turfe continued his bond, set earlier by another Judge. According to some legal experts, charges of second-degree murder generally result in remand, although it is not required. Senior Pastor Willie Rideout of All God’s People Chuch. A witness at the scene of the car accident said it took both the Detroit Police and EMS an inordinately long time to arrive after two 911 calls. If they had arrived before McBride left the scene, they might have saved her life. Renisha McBride’s friends said buttons supporting justice for her can be purchased at Lovejoy’s Printing at Seven Mile and Evergreen. I’m sorry about the girl and I hope the best for everyone. “no evidence that alcohol or marijuana had contributed to her death”? I find it interesting that with a BAC of up to 0.29 (14.5x the legal limit) and a possible head injury that it didn’t contribute. Medical Examiner Kilak Kesha said if she had endured such an injury (brain trauma from hitting car windshield) it could have either caused aggressiveness or passivity, but there was no evidence to support either alternative. “McBride became somewhat argumentative [before she left the house after drinking underage] but said she was never combative or hostile that night” said her friend. 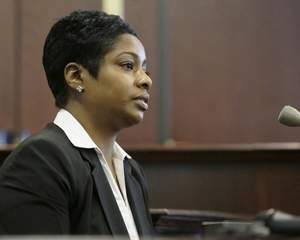 To what degree could the unknown events that transpired during the missing 3 hours had on ms McBride. I’m glad to know about the stalker case in the gentleman’s past, I had not heard that and it does bring some context to the event, although I question bringing up his drinking with an ex-girlfriend almost two decades ago (possibly before Ms McBride was even born) has to do on the current events. Sorry about the girl and her family, but enough with the if white people are never blamed BS. Can’t we just focus on one person is dead and leave it at that. Honest question which I feel confident that I will get blasted for but. How much does the constant reporting that the only reason that a black person is ever stopped is because they are black and if a white person did such a thing they are always innocent, how much does this result in people looking for proof of the concept and allowing people to see it even if/when it is not there. All and all this is the best article that I have read so far. Very factual reporting all sides. I truly wish more articles on all subjects were more like this. If you are old enough to recall the Malice Green case (referenced several articles up on Voice of Detroit, you will remember that ME Khalil Jiraki’s opinion was that Green’s death was caused by Officers Larry Nevers and Walter Budzyn, with multiple blows to the head that nearly detached his scalp. He was then fired because he would not say that cocaine in Green’s system “contributed” to his death. 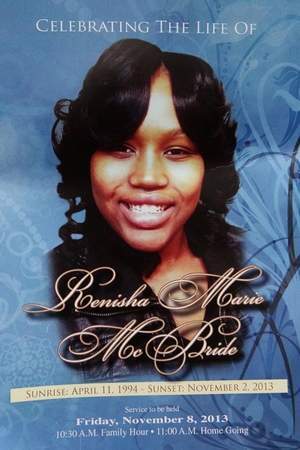 In Renisha McBride’s case, the M.E. stated clearly that the massive shotgun wound to her face would have caused instant death, even if EMS was on the scene. He stated specifically that alcohol and marijuana use were not a contributing factor. You are mixing apples with oranges. They, along with any possible head injury from the accident, may have been a contributing factor to her wandering away and ending up on a stranger’s porch. But she was thoroughly ALIVE when she stepped on Wafer’s porch–she would NOT have died from substance abuse. The ME made CLEAR that any massive shotgun wound of that magnitude to the face would have killed anyone. There was no necessity for Wafer to open his door, as the judge said, if he feared for his life. Why didn’t he just call 911 FIRST like the witness whose car McBride hit in front of her house in Detroit instead of choosing to blast a teen-age girl in the face with his shotgun. Under Michigan law, there has to be an imminent threat of death or serious harm for such force to be used in self-defense. There was none. 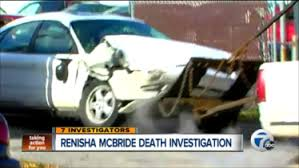 Note the difference between the response of a Black woman to Ms. McBride at the scene of the accident–she sought to assist her, and the response of a white man, Wafer, whose FIRST REACTION was to go to his back bedroom, get his shotgun, and blow her away. As Pastor Rideout says in the story, Wafer has not to this day spent a day behind bars, whereas a Black man who did the same thing to a white woman would have been UNDER the jail, remanded without bond. RACE IS ALWAYS A FACTOR in this system.